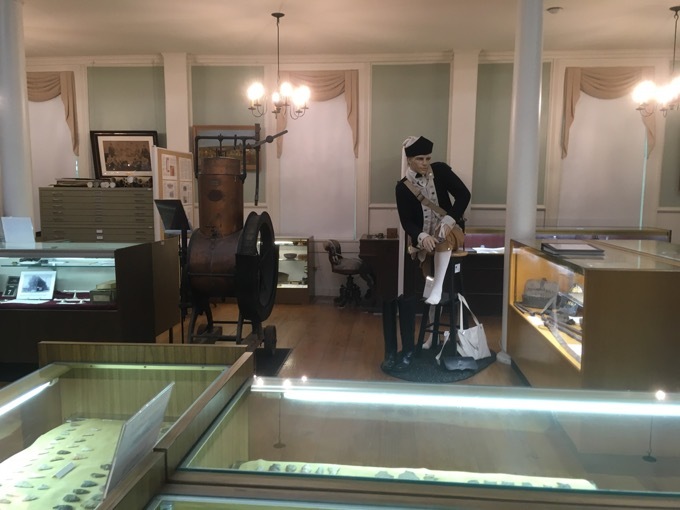 I am confident in saying that The Old Town Hall Museum is the crown jewel of Enfield. One could argue that the LEGO North American headquarters is the true gem in town, but it’s not exactly open to everyone. 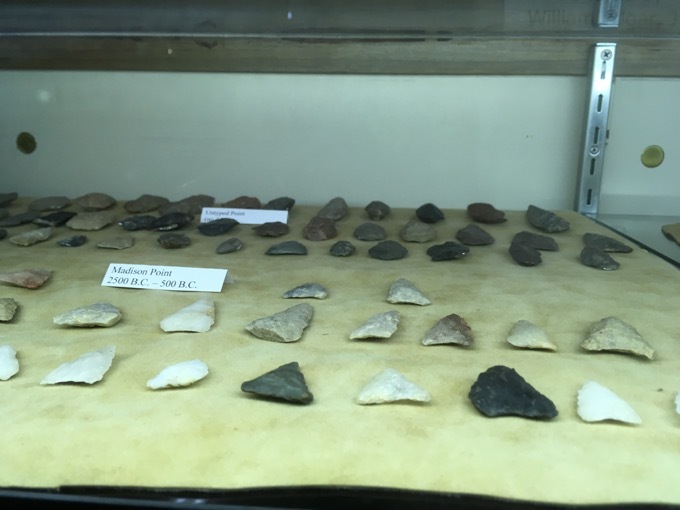 So I’m sticking with this place; a three-floored town history museum that tells the story of tens of millions of years of local history. And does it well. I often am asked how in the world I can keep going to “the same” (type of) museums over and over. 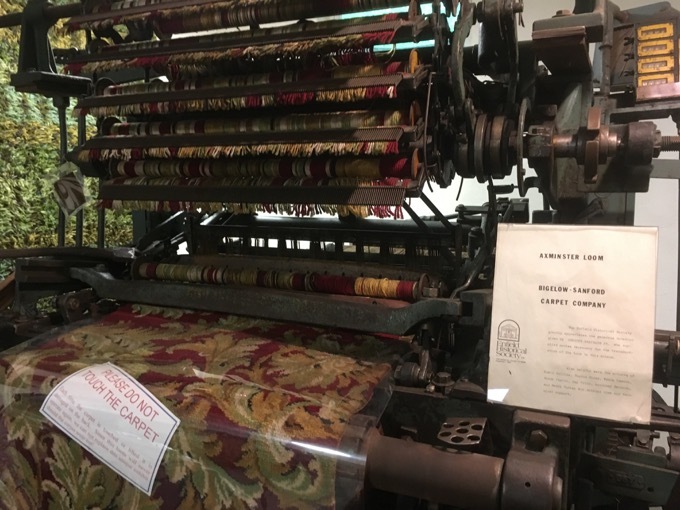 My usual answer is that when a museum seems similar to others I’ve been to, I seek out what makes it unique. I’ll admit that yes, sometimes that is a struggle. 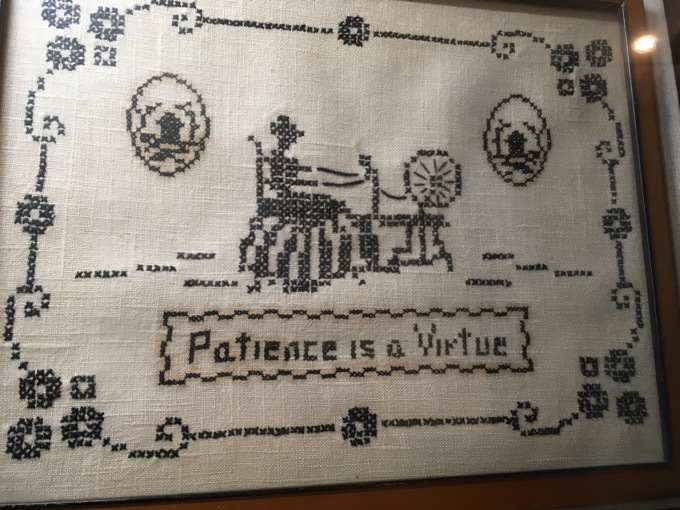 But most times it’s not. 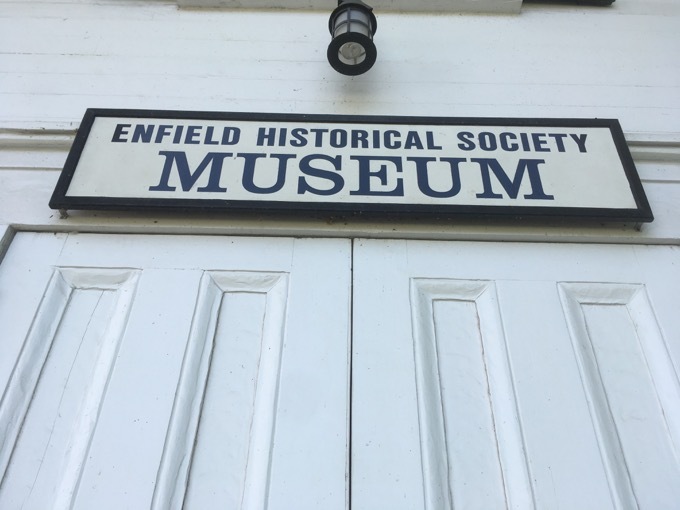 As for this place in Enfield, it is clear right off the bat that the Shakers shook up this town and their place in its history is paramount to the Enfield story. Shakers and gunpowder and dinosaurs. But let’s start with the impressive building this is all housed in. 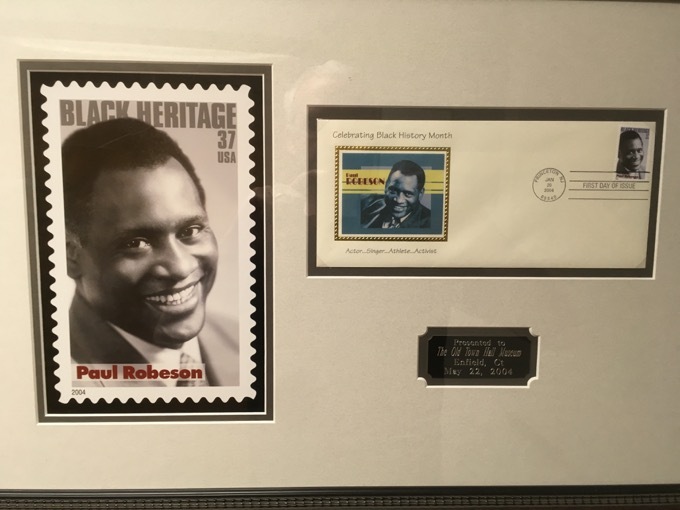 Paul Robeson was rad. He lived just down the street from this museum. I’ve been there. 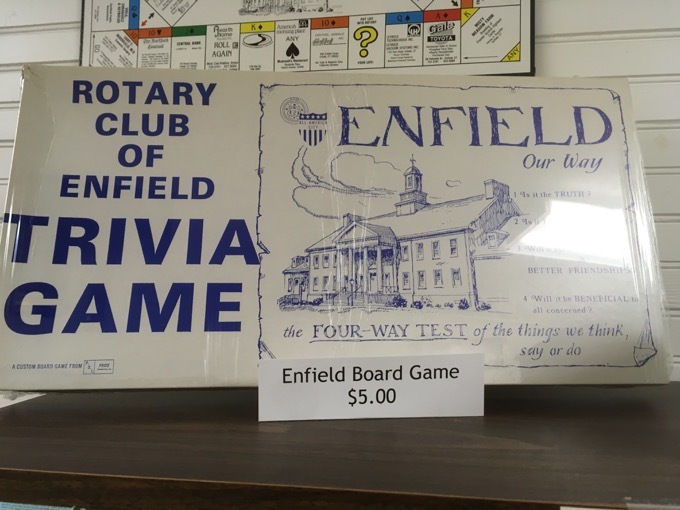 The Old Town Hall has been a part of Enfield history for over 200 years. 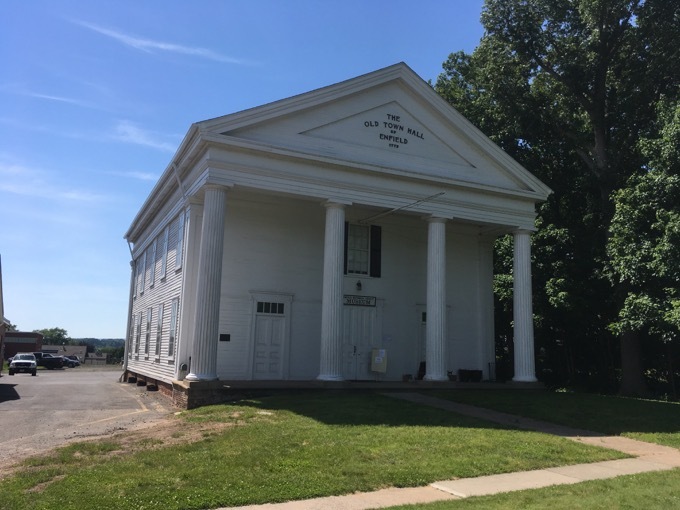 Opened on January 1, 1775, the Old Town Hall begin its service to the community as the third meetinghouse of the First Ecclesiastical Society. Only a year later Enfield’s Minutemen were attending services in the building when Captain Abbey used his famous drum to announce the outbreak of war at Concord and Lexington. 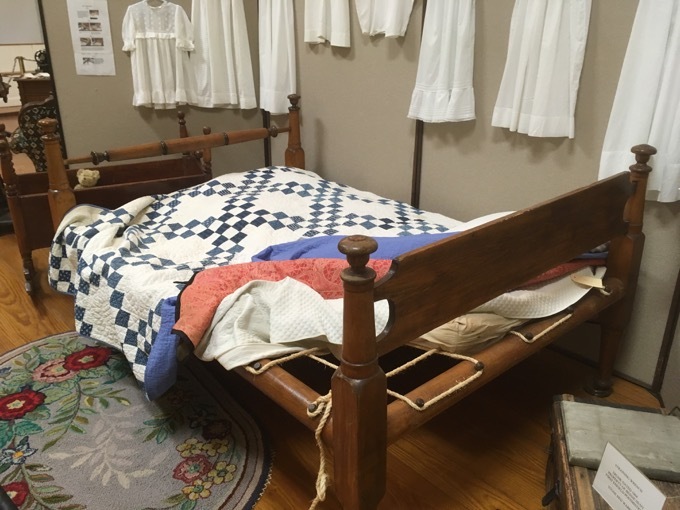 The ol’ “sleep tight” bed! Holy cow. You see? I was walking around in a building older than our country! That’s always cool. In the 19th century, the building was converted into the town hall: the steeple was removed, a front portico was added, and the balcony was converted into a second floor. In the years that followed, the Old Town Hall was the site of many political rallies, elections, town meetings, and social events. In 1892 a new town hall was opened and the Old Town Hall began to suffer from neglect. Many lean years passed… In 1964 the building was condemned. The end was very near. 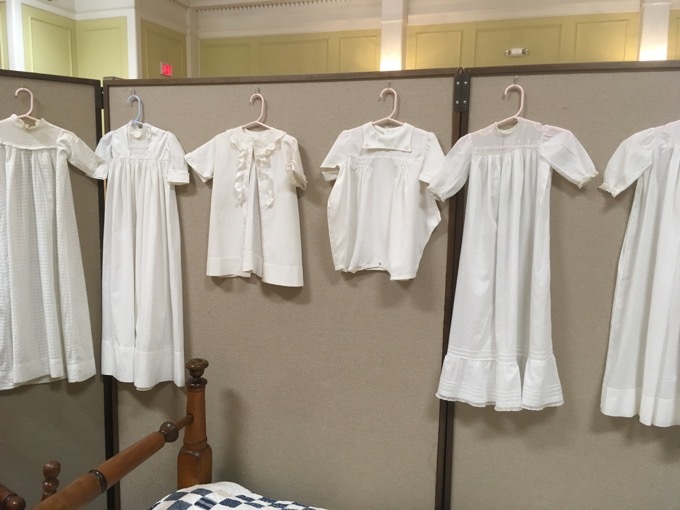 In 1972, the Enfield Historical Society saved the day and began restoration. It took 8 years and incalculable sweat equity, but it was opened in 1980 as the museum it is today. And like I said, it’s quite good. We’ll start in the basement. A docent told me about how her husband was one of the wonderful folks who saved this building and helped restore it. Part of that restoration involved the basement which, if I’m remembering correctly, was a mud floor prone to flooding. 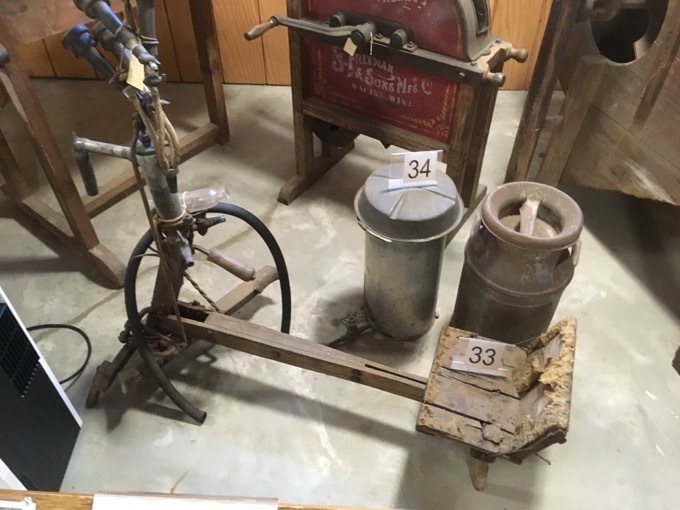 The agriculture display includes scores of implements; hand tools, plows, even a foot-powered milking machine from Enfield’s farms. 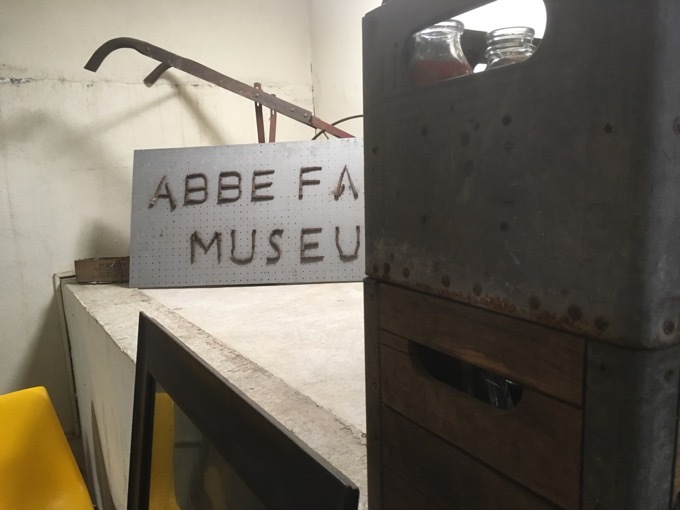 I spied a sign hidden away that said, “Abbe Farm Museum.” Whoa, I wondered… was this another museum-within-a-museum? Or a long defunct museum that has been absorbed by the mighty Old Town Hall Museum? For once, I smartly let it go. 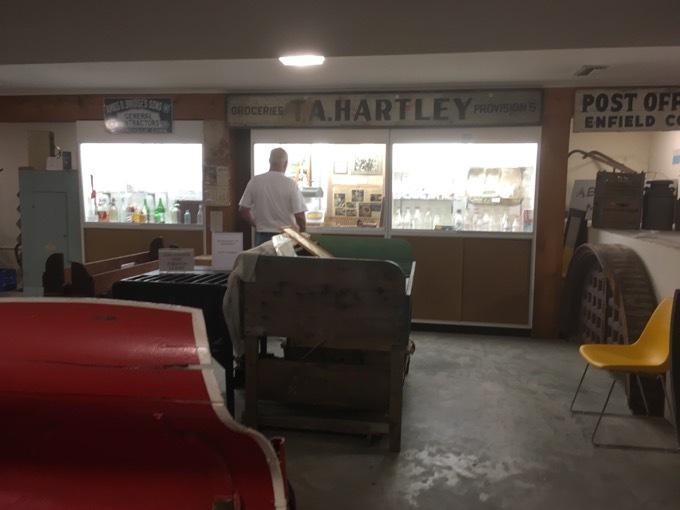 There were lots of old dairy bottles on display here as well as stuff from the Thompsonville Bottling Works. 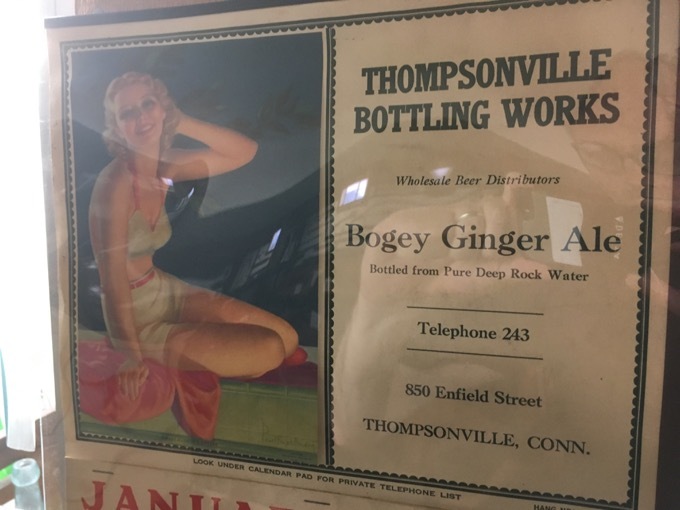 They apparently made Bogey Ginger Ale, which seems like a terribly named soda to me. I rather love the pair of giant scissors. 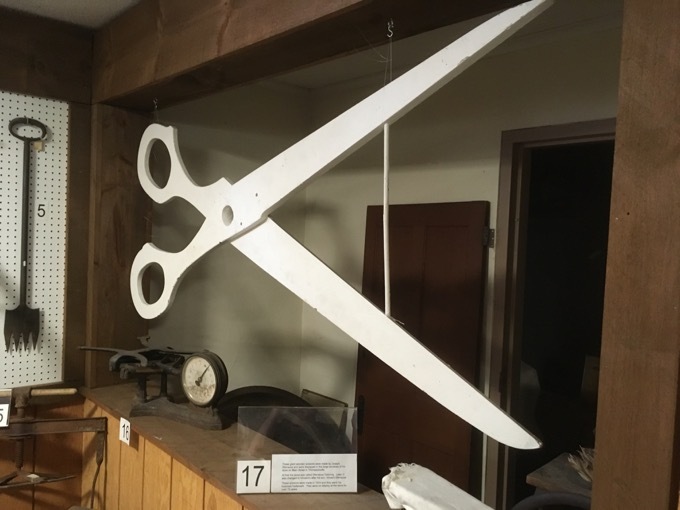 These scissors hung about Joseph Sferrazza’s tailor shop on Main Street for over 70 years. 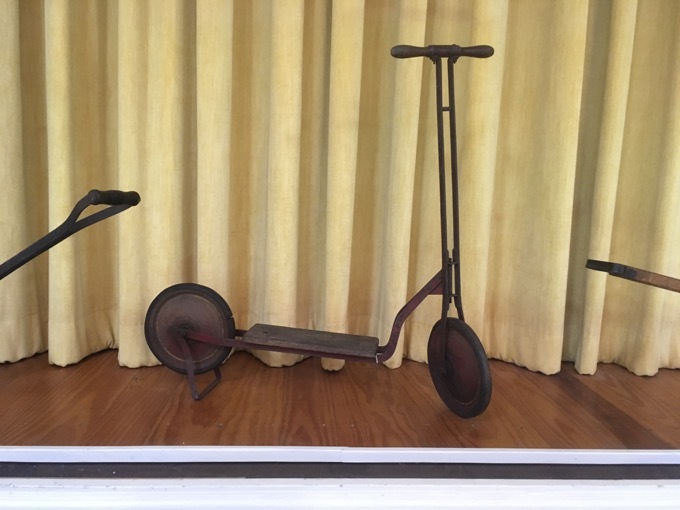 They were made in 1924 and quite frankly, I don’t know why they’re in a museum’s basement display. They are better than that! 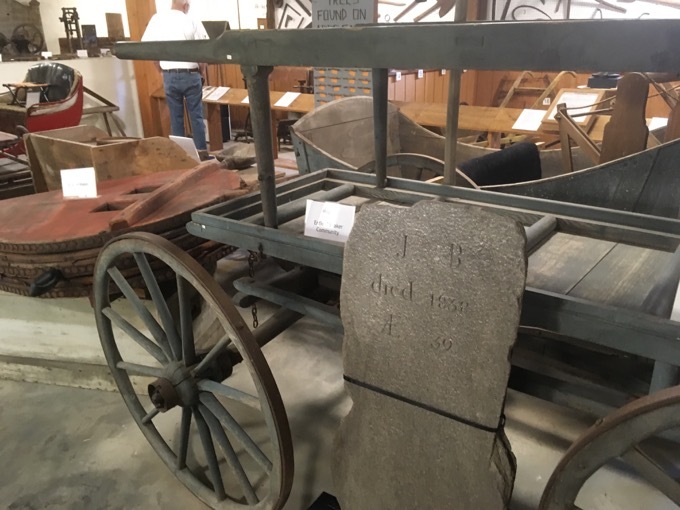 They house a bunch of larger Shaker items down here like a horse drawn hearse and a massive blacksmith bellows. 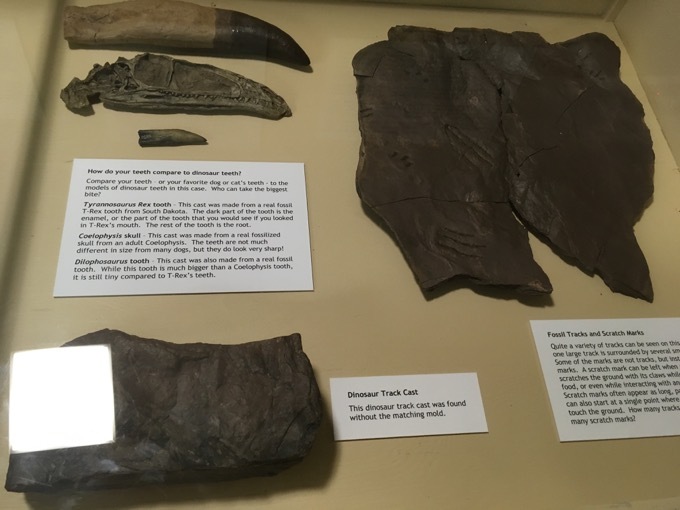 But the highlight for me… wait, giant scissors were my highlight – so my second highlight was all the fossils and geological items of interest. I like to see how these museums that cover EVERYTHING incorporate stuff like this. Over here, some old furniture from a weirdo celibate Christian sect. Over there, some old milk bottles. And right here? 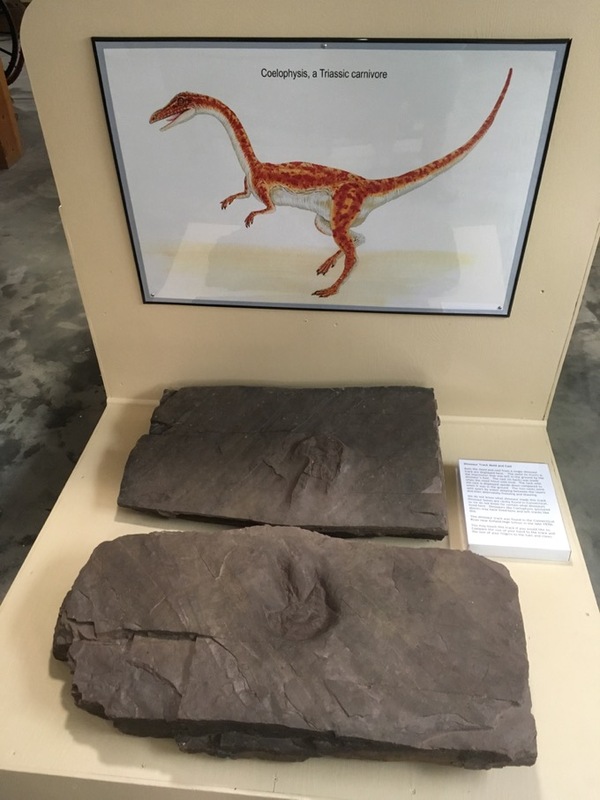 dinosaur fossils. (To be honest, these aren’t dinosaur fossils per se, but dinosaur tracks. There are lots of them in Enfield in the same type of mud/rock formations as at the much more famous Dinosaur State Park in Rocky Hill. There is mineralogy display too, but most of the good stuff is about dinosaurs and coal. Let’s go upstairs. The main floor is, I guess, the showpiece of the museum. I believe most of what’s here would be considered the permanent collection. Of course, anyone who knows anything about Enfield knows that the two main Enfield stories are Shakers and gunpowder. Though it may sound like they are, I assure you they are not related. So about 2/3 of the main floor is dedicated to the kooks and the Hazard Powder Company. 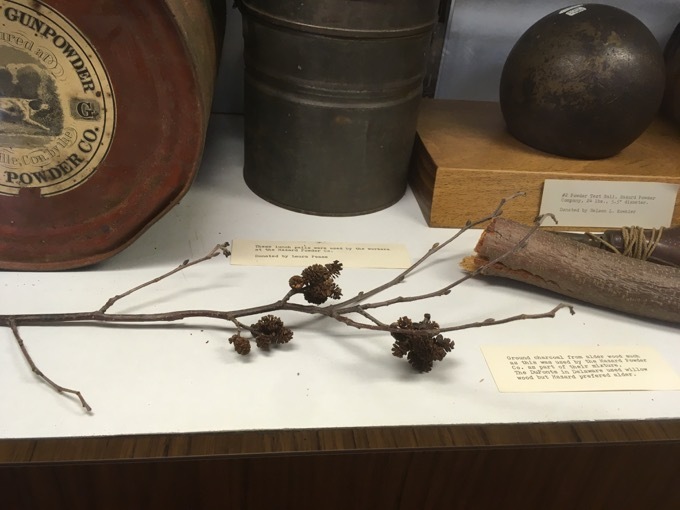 To get some true feet-on-the-ground perspective about the history of the Hazard Company, you can hike all over Scantic State Park like I did to check out the relics. Or you could just come here, of course. 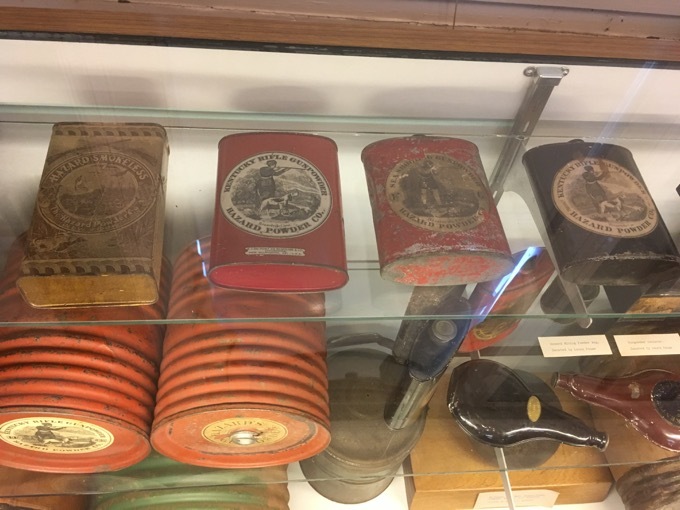 The museums’s collection includes numerous gunpowder kegs, tins, photos, and other artifacts of Colonel Hazard’s industrial empire. And it WAS an empire. Hazard supplied a massive percentage of black powder to the Union troops in the Civil War. 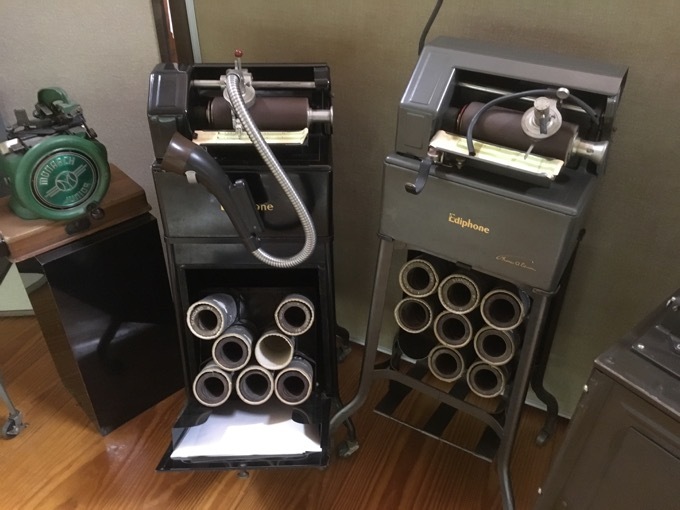 There are some cool artifacts here like this thing, called an eprouvette. 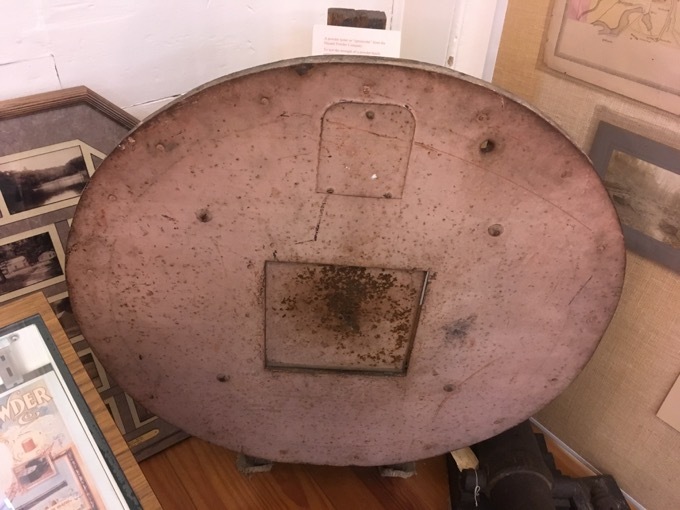 To test the strength of a powder batch, cartridges were fired at the center panel which absorbed and recorded the impact of the shot on the scale at the back of the panel. Cool. 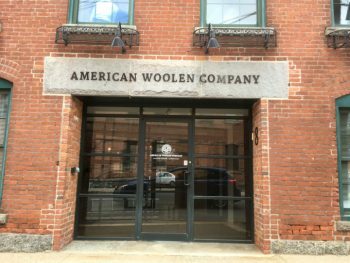 If you’ve read this far, you probably know all about the Hazard Powder Company. If not, here’s a primer from the historial society. Hazard preferred alderwood. Which I guess this is from. The Shakers are gone from Enfield, but their presence is still felt. 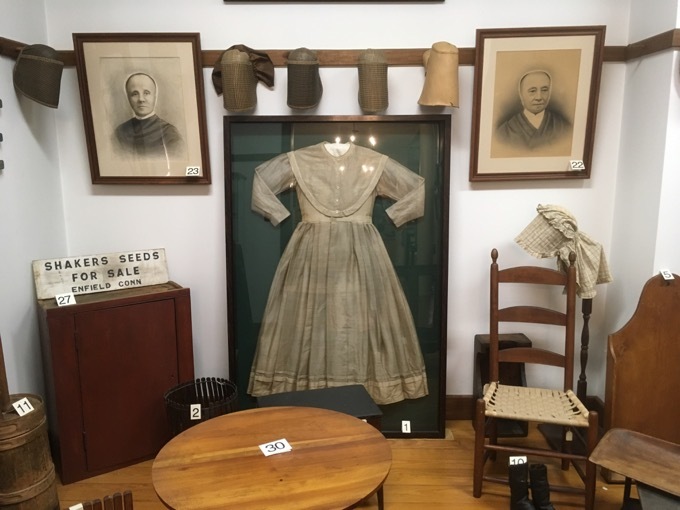 Many items from the Enfield Shakers are displayed here, including boxes, clothes, and their famous furniture. Across America’s history of dopey religious sects/cults, the Shakers are right up there near the top. Brilliant. They helped out orphanages by taking in the orphans and brainwashing the poor kids raising them in loving homes. OF WEIRDO FURNITURE OBSESSED CELIBATES. 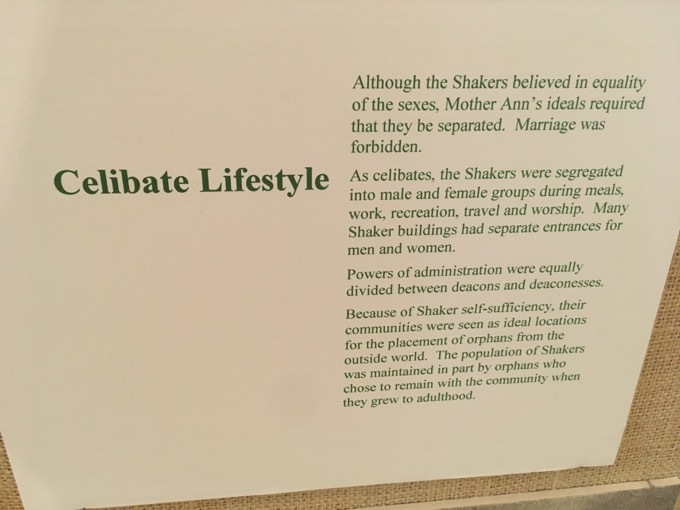 There is still an active Shaker village somewhere up in Maine. 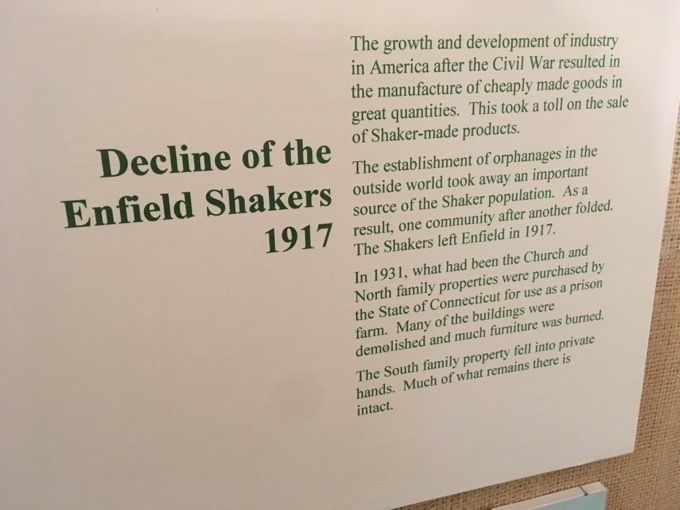 The Enfield Shakers actually lasted from about 1780 until 1920 or so, which is fairly impressive for a group that couldn’t procreate. Oh wait, no it’s not. That’s 140 years; about the duration of 3 generations which makes sense if you think about it. Sorry, they were just lame. The whole thing was just absurd, but they were self-sufficient and for whatever reason, built great chairs and stuff. 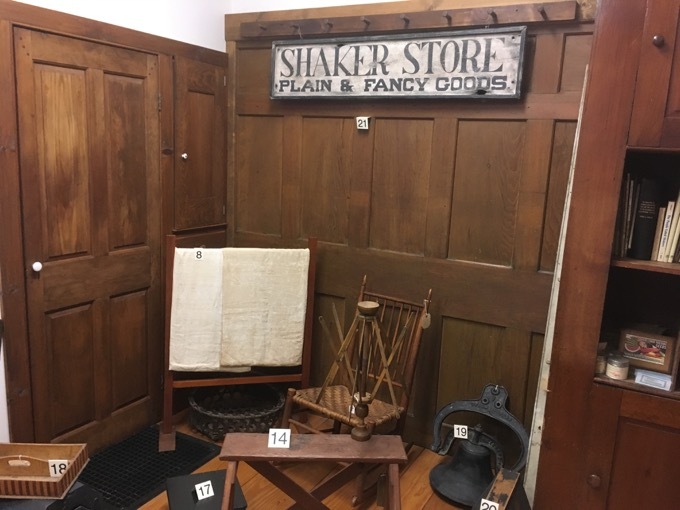 People love Shaker furniture to this very day. 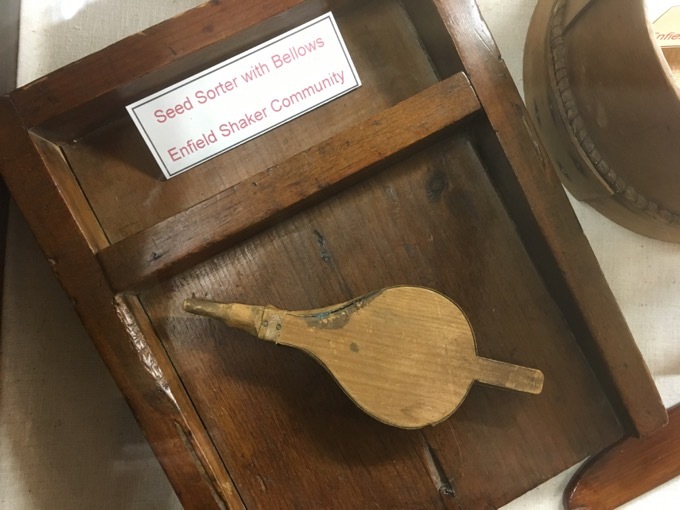 Our Enfield Shakers were huge hits in the seed industry. Read more about them on Wikipedia. People forget that they were an apocalyptic cult too. Shoulda had a Shaker dude who was now a skeleton due to his “patience” regarding his girl. 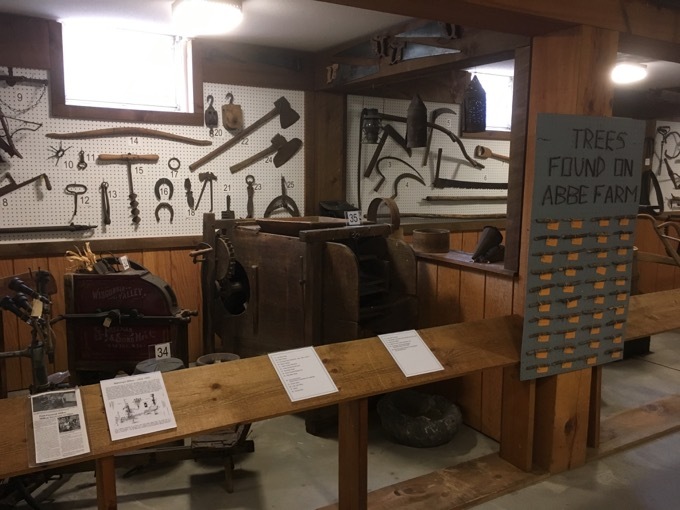 Enfield’s Shaker Village doesn’t really exist like it used to, but my “visit” there in 2009 happened to be the very first thing I did in Enfield. Fancy that. The exhibits up here appear to be of a more temporary nature. The room itself is really cool; remember 10 minutes ago you read that this used to the balcony of that 1775 church? They kept the structure of the balcony, but put a floor in front of it. 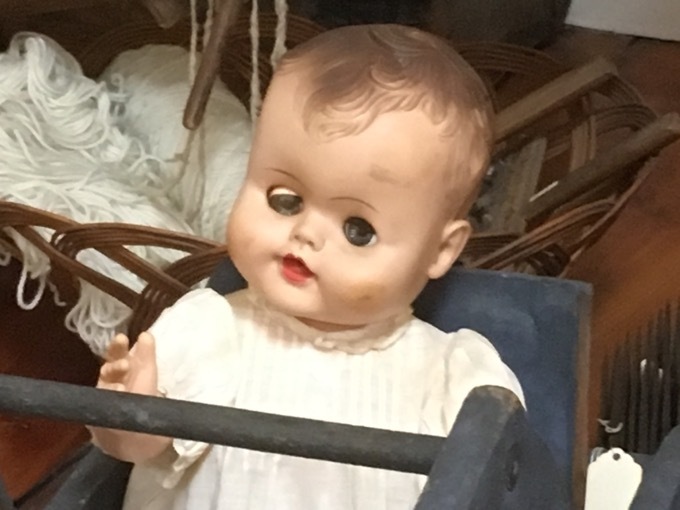 It’s oddly disconcerting somehow. 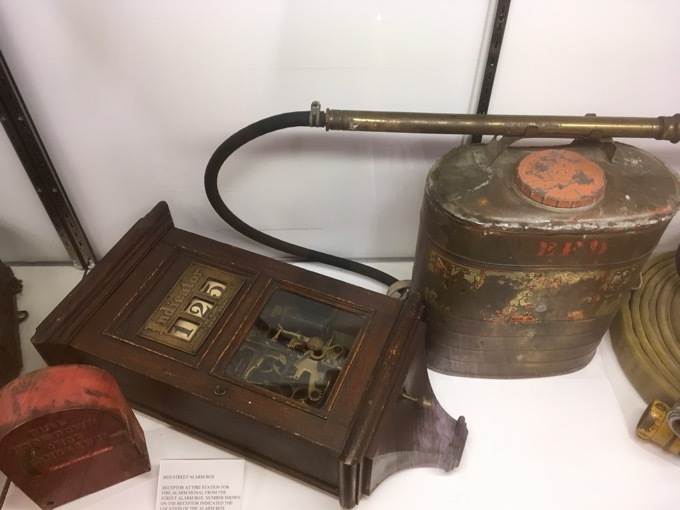 There are a bunch of old timey toys, Victorian dresses and such, and of course a whole area dedicated to the Ediphone Dictation System and other old electronic devices. Why not? 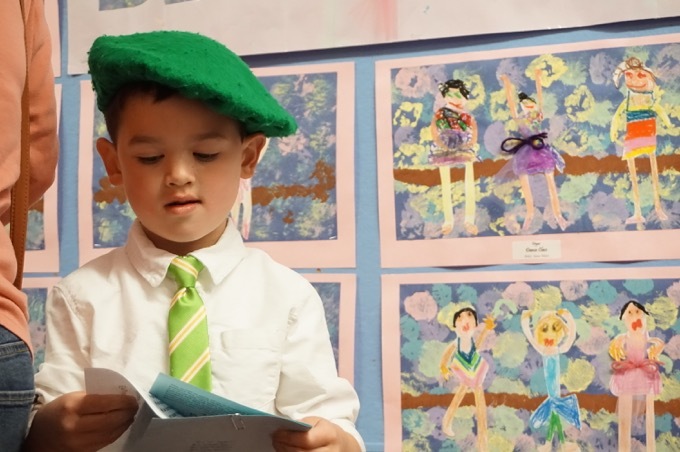 Let’s look at some pictures. Much more exciting than reading my stuff. This doesn’t look like fun though. 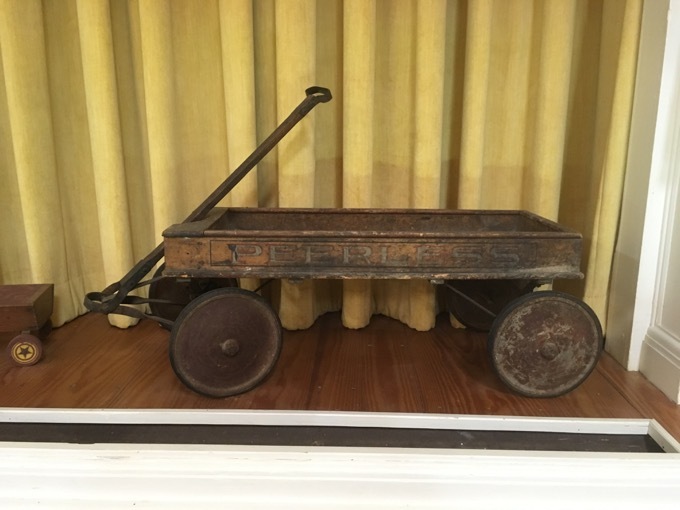 Awwwwww, speaking of cute, a dolly! AHHHHH!! Burned again by a CREEPY DOLL! 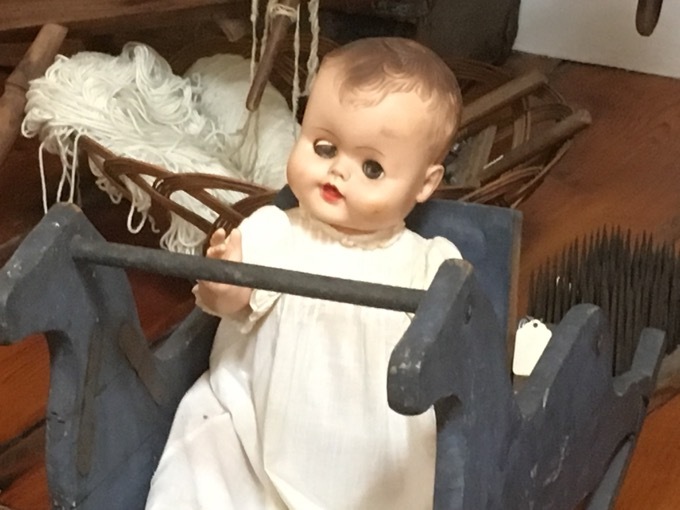 I needed something less evil to get that doll’s eye out of my mind. How about some Nazis? 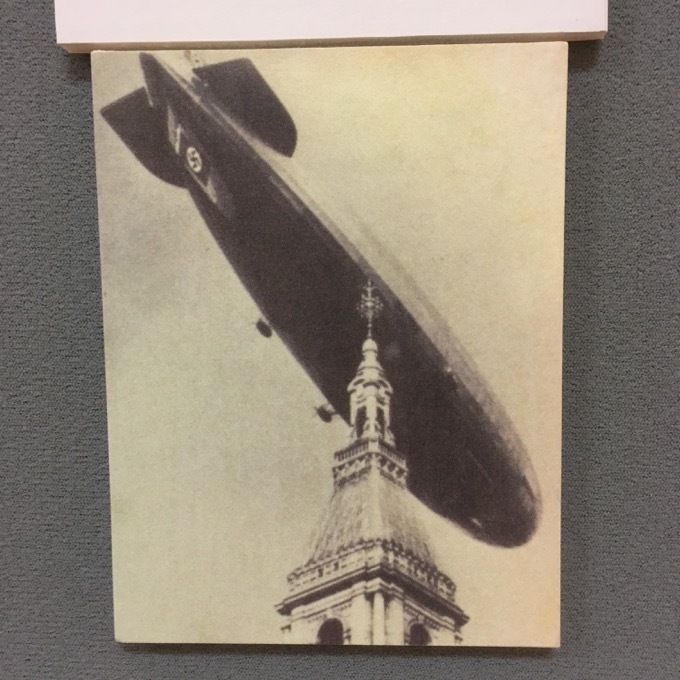 I stared in fascination at the depictions of the Hindenburg flying over Enfield and Hartford in 1936. Here was a story that I’d never heard before, and for whatever reason, I couldn’t get enough of it. 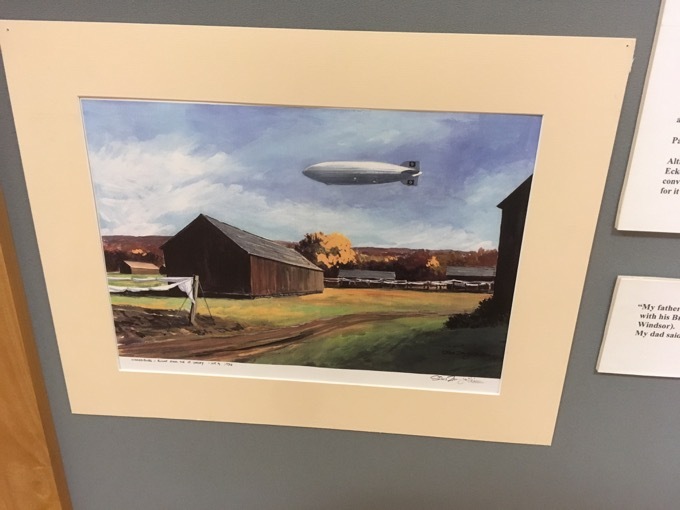 The Hindenburg quietly floating over Enfield tobacco barns. I hate Nazis. 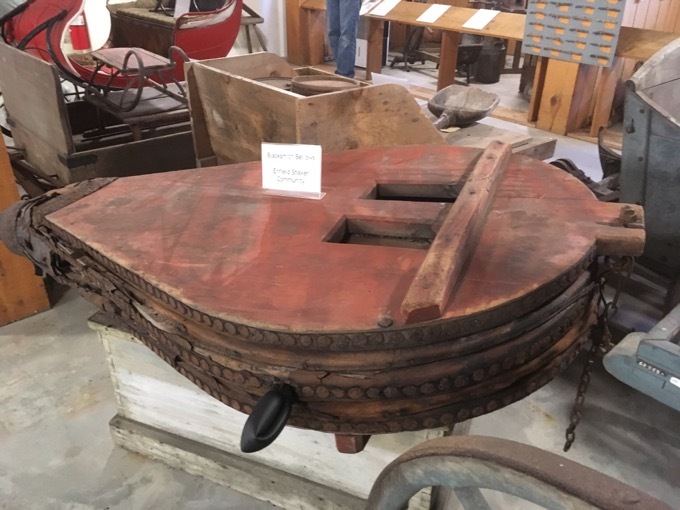 The docent came over and began telling me everything she knew about that day and how no one in Enfield got a decent picture of the thing. There is, however, this shot of it over the Traveler’s Tower in Hartford which is pretty amazing. And there you have it! 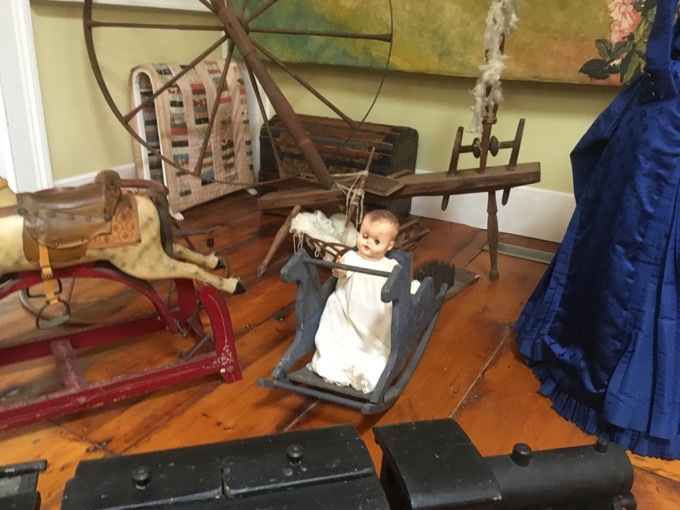 Certainly a very eclectic town history museum – which all town history museums should be like. If I had to come up with a negative about this place it’s that it was too big and too good. 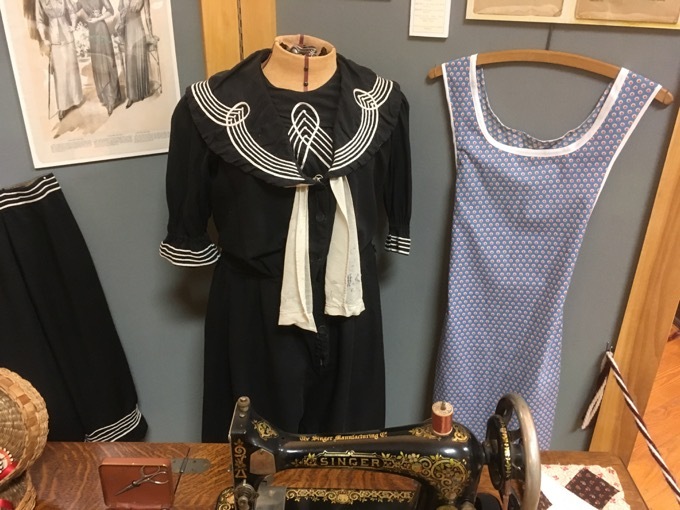 I hadn’t expected so much, so it took away from my time at the next museum – the Martha A. Parsons House. I poked around the “gift shop” which left a bit to be desired. However, there was a box of free old magazines – and I love free old magazines! 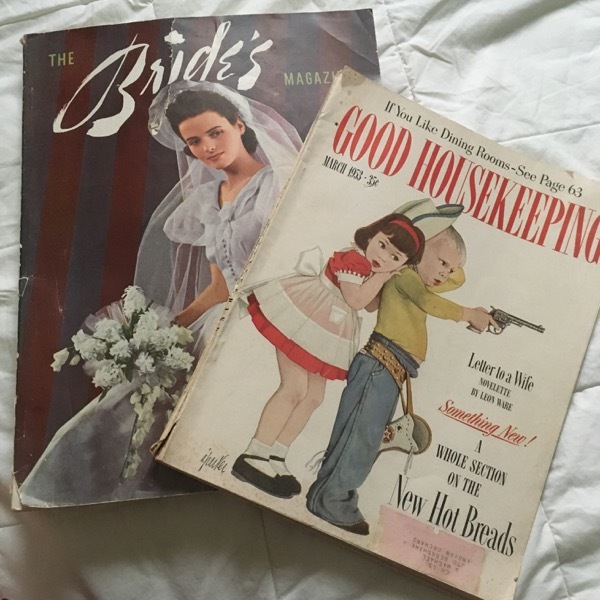 I took a Good Housekeeping from 1953 and it was really fun to skim through. Thanks Enfield! 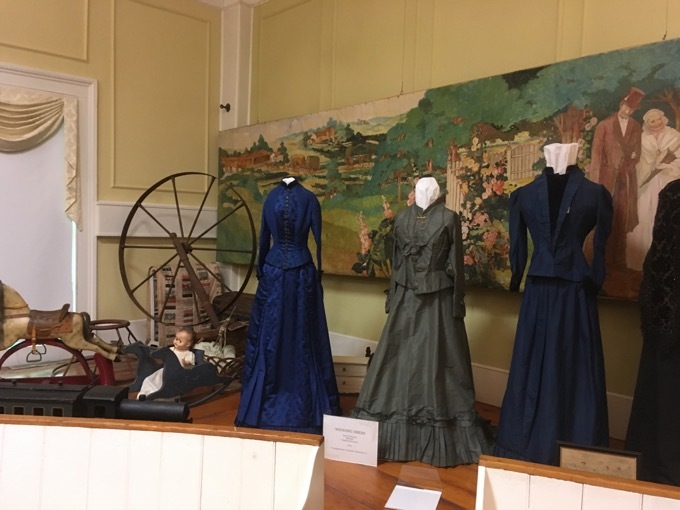 You have a great town history museum and I never want to hear you complain about it.